Avelino Vieira scored twice for Peterborough Sports. 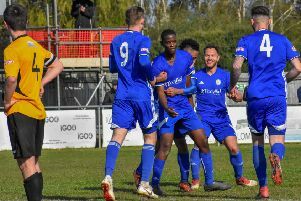 Peterborough Sports clinched promotion to the ChromaSport & Trophies United Counties League Premier Division in grand style yesterday (March 26). They hit struggling Bugbrooke for six and the 6-1 win earned them promotion with six games still to go. A win tomorrow (March 28) against Thrapston will give them the Division One title. Avelino Vieira hit Sports’ opening goal on 15 minutes and Jordan Macleod doubled the lead after 28 minutes with David Cobb adding a third four minutes later. Dan Clements scored number four after 64 minutes with Karl Gibbs getting his name on the scoresheet five minutes later. Vieira completed the Sports tally in the last minute with his 33rd goal of the season, matching team-mate Gibbs’s total. Elsewhere in Division One, Bourne’s six-match unbeaten run came to an end at Buckingham Town. The Wakes lost 4-2 with Zak Munton and Ash Firth hitting late goals for them. Blackstones maintained their good run with a fine 2-1 win at Rushden & Higham United. Zack Fisher and Jones De Sousa were their second-half marksmen. In the Premier Division, a late double strike from Dan Cotton earned the Cuckoos a 2-2 draw with Harrowby United at In2itive Park. Cotton struck after 77 and 87 minutes to earn the Cuckoos their point and he’s now the division’s top scorer with 32 goals for the campaign. Deeping Rangers ended a seven-match run without a win when defeating visitors Oadby 1-0. Will Bird scored the vital goal nine minutes into the second half. Fifth-placed Holbeach were well beaten at third-placed Newport Pagnell. They lost 3-1 with Josh Ford scoring an 80th minute consolation goal. Peterborough Northern Star were also 3-1 losers after going 3-0 down inside half-an-hour at Sleaford Town. Craig Smith got Star’s goal with nine minutes remaining. Wisbech Town lost 2-1 at home to Northampton Sileby Rangers. Adam Millson netted for Wisbech with seven minutes left but it was too little too late for the Fenmen. Stamford’s relegation worries mounted after a 1-0 defeat at home by Northern Premier Division leaders Blyth Spartans. In Division One South, Spalding drew 1-1 at Belper Town after leading through a Joe Curtis goal. UCL Premier Division: Yaxley 2, Harrowby United 2; Deeping Rangers 1, Oadby 0; Newport Pagnell 3, Holbeach 1; Sleaford Town 3, Peterborough Northern Star 1; Wisbech 1, Northampton Sileby Rangers 2; Northampton Spencer 7, Huntingdon 0. UCL Division One: Peterborough Sports 6, Bugbrooke 1; Buckingham Town 4, Bourne 2; Rushden & Higham United 1, Blackstones 2. Evo-Stik League Northern Premier Division: Stamford 0, Blyth Spartans 1. Evo-Stik League Division One South: Belper Town 1, Spalding United 1. Thurlow Nunn Eastern League Division One: Team Bury 0, Match Town 3. Northern Premier Division: Barwell v Stamford. Division One South: Spalding United v Lincoln United. Premier Division: Holbeach United v Wisbech Town, Huntingdon Town v Eynesbury Rovers, Peterborough Northern Star v Yaxley. Division One: Blackstones v Bourne Town, Peterborough Sports v Thrapston Town. Division One: March Town United v Ely City.